Aazaadiyan from Udaan is playing at full volume. Barely able to hold myself up, I’m leaning on the chair to stand…. Holding a hand towel in one hand, and caressing this chair I’ve been given with the other. My eyes looking at the small bits and pieces that have no use to my brothers and have been left to me. 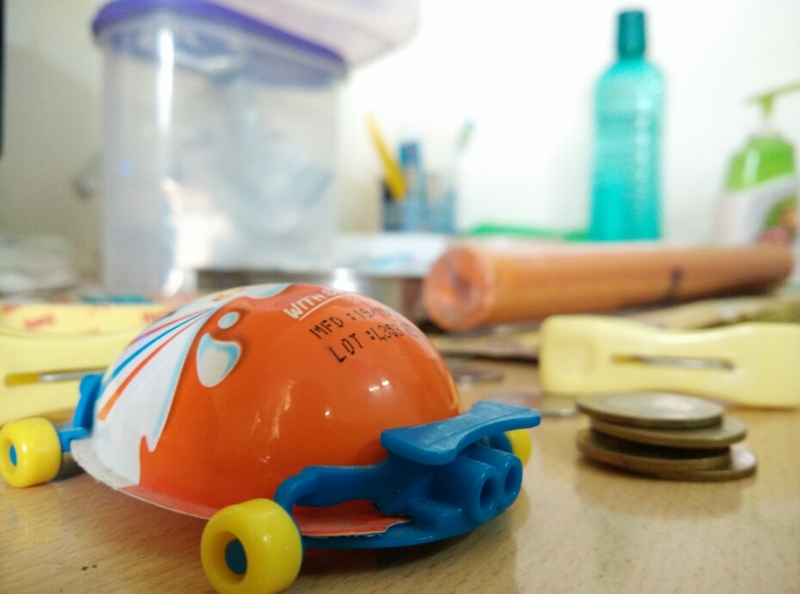 Fan, speaker, question papers, coins, soap, shampoo, clips, plastic toys…. I took all of it. I am looking at each of them, imagining how when I’ll use them, it’ll remind me of them. Of each of their habit. Of how I had a large share of happiness in my life. Of what I’ll miss. It’s surprisingly ironical how my friends were ‘too cool’ to gift each other something @ farewell, and ended up finally gifting me so many things that my room. I usually like my room to be clean, and yet it is filled with these tokens here and there that no matter what corner you turn to, a breath will inhale someone’s thoughts with it. Oh, economics should learn from here. How a useless thing just becomes invaluable. Anyway, it’s time. I waived goodbye to my brothers. I hugged each member of my family. My strength, my backbone, my madness, they’re on their own now, mature and more perfect than before, Those idiots who have been my life here. I spoke, “Goodbye. All the best bhai.” Overwhelmed with emotions too strongly to say anything else, leave aside how I wanted to personally speak with each for long enough that it could have turned into a book. These feet used to walk together, to the mess, on the sand, in the classes, and will now walk a hundred different paths. They’ll lead a bigger world. And I know for one that they’ll shine because of the blood that rushes within them, that warms this cold world and life. Secondly, I know no matter how big the crowd is, if I’ll be there they’ll recognize me, and vice versa. my whole life. You’ve given me enough time already to cherish through my life. Farewell brothers. Live your life to the fullest. 1. No matter how successful you were here, you’re a new-born in the outer world. You gotta start from scratch and win again. 2. Dream big and keep walking.